Walk by the study rooms In Austin Hall during finals week, and one can quickly lose that nostalgia for “the college days.” The pressure and stress are etched onto tired faces of students, and the intense quiet resonates more than the usual din of the students rotating through classes. Add to the pressures of work-study jobs, internships, club involvement, and for those 102 elite athletes in the College of Business, NCAA Division I athletics. Every sports season includes an end-of-term grand finale that typically coincides with exams. Never mind training schedules and competition commitments that include extensive travel. It may come as no surprise that – despite support programs within academics and athletics – there are some chinks in the emotional armor of students, and student-athletes, in particular. Finance major Nathan Braaten is a midfielder on the Oregon State men’s soccer team, and a Pac-12 All-Academic First Team honoree. He also is a co-founder of the Dam Worth It mental health support campaign, a movement he started because there’s still too much stigma associated with mental health issues for students to seek help before a situation becomes untenable. The Dam Worth It campaign launched in concept in October 2017, with its first outreach to the OSU sports community one month later. 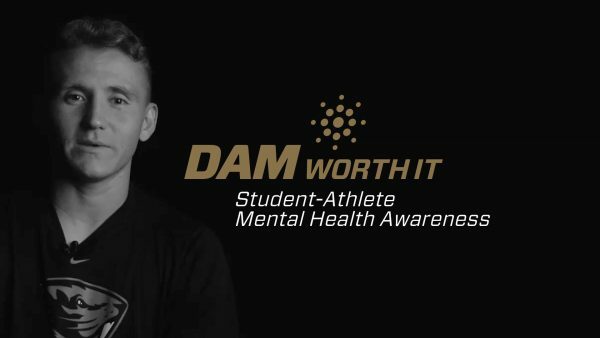 The Dam Worth It campaign’s public launch occurred in the same week as the January 2018 suicide of Washington State quarterback Tyler Hilinski. Hilinski was slated to be the starting quarterback in 2018 was described as outgoing and bubbly, and Hilinski’s death was a heavy hit to his family, team and the Pac-12 community. Braaten and his Dam Worth It co-founder Taylor Ricci, a former top OSU gymnast and College of Public Health and Human Sciences academic standout, were impacted by the many stories about athletes facing mental health challenges across the national, the Pac-12 as well as their own rosters. Their public initiative began with #DamWorthIt social media outreach, and a physical presence at winter season sporting events alongside student workers from the university’s Counseling and Psychological Services. When Braaten researched into mental health issues of college students, he learned that roughly one-quarter of students identified a struggle with depression or had a mental health concern in the past year. Two-thirds of these students did not seek any help at all ― not a health care professional or even a family member or a friend. Far from hiding, the Dam Worth It campaign has earned headlines in USA Today, Sports Illustrated, and other major media outlets. The duo has a grant proposal in with the Pac-12 to build and expand the campaign, plans high-profile events with guest speakers and a continued presence at sporting events. Ricci’s personal profile video was completed this winter, and Braaten’s will be released this spring where they share their stories about their losses and their personal struggles. Suicide is the seconding leading cause of death among people aged 15-34 in the United States, and depression affects 20-25 percent of Americans aged 18 and older in a given year, according to the U.S. Centers for Disease Control and Prevention.